It was really quite astonishing how fast the second dome, the Jungle Dome, went up now that we know what we are doing! While a layer of concrete and rice husks was going on the Blue Moon Dome, a couple of people were working on the base of the second dome. 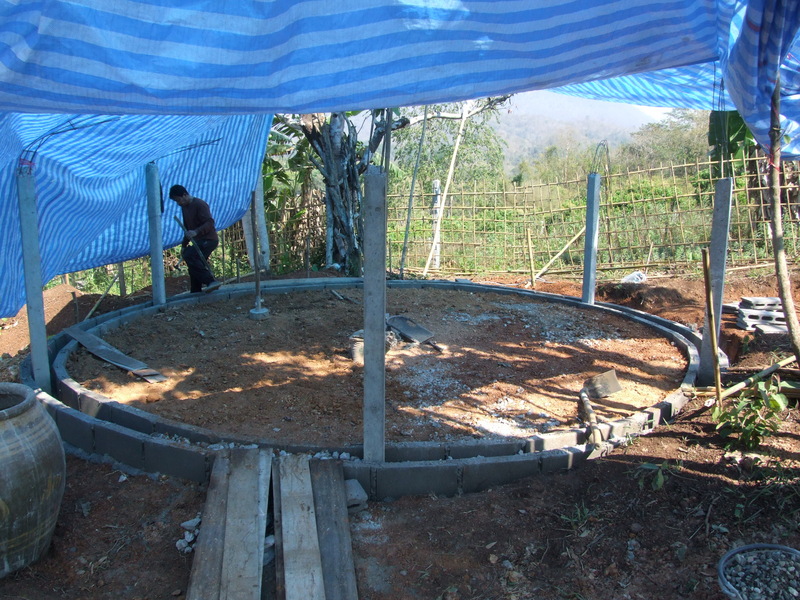 The base of the Jungle Dome gets a concrete surround for termite and rain water protection. All hands were on deck when it came to constructing the bird cage. And it went up so easily, and much more securely, than the Blue Moon bird cage. The team constructs the Jungle Dome bird cage. 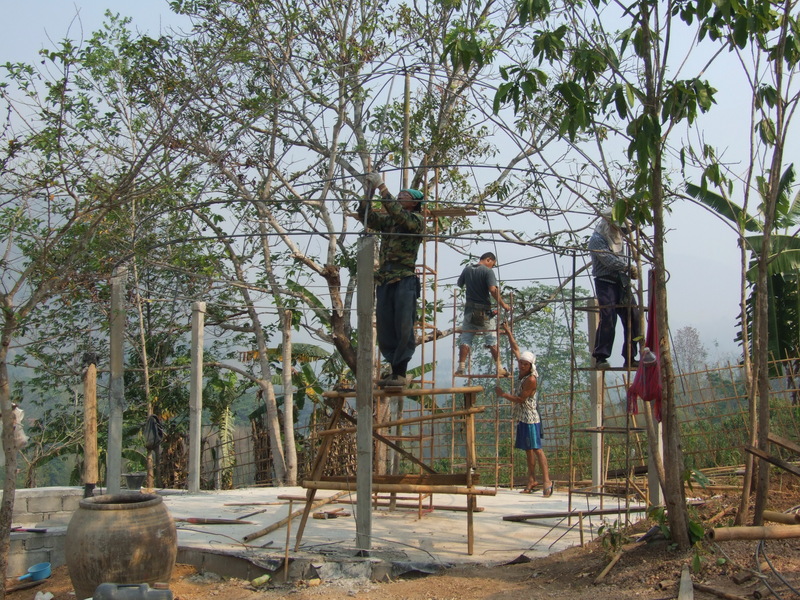 We have finished all the useable bamboo on site, though luckily it grows really quickly and by next year we should have plenty. For now we have to go to bamboo ‘orchards’ to cut what we need and pay for it (10 Baht per piece). 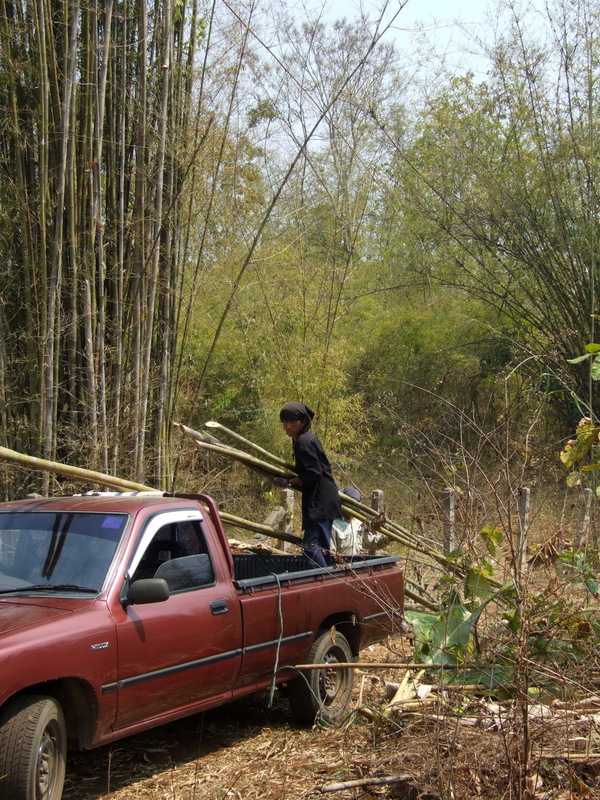 Loading the bamboo onto my trusty truck. Bamboo lattice completes the bird cage. In the Blue Moon dome hemp string was used to tie the bags onto the bird cage. However, this can only be bought in the city of Chiang Mai, and it was not that strong. So this time we used the Thai favourite string, and colour! 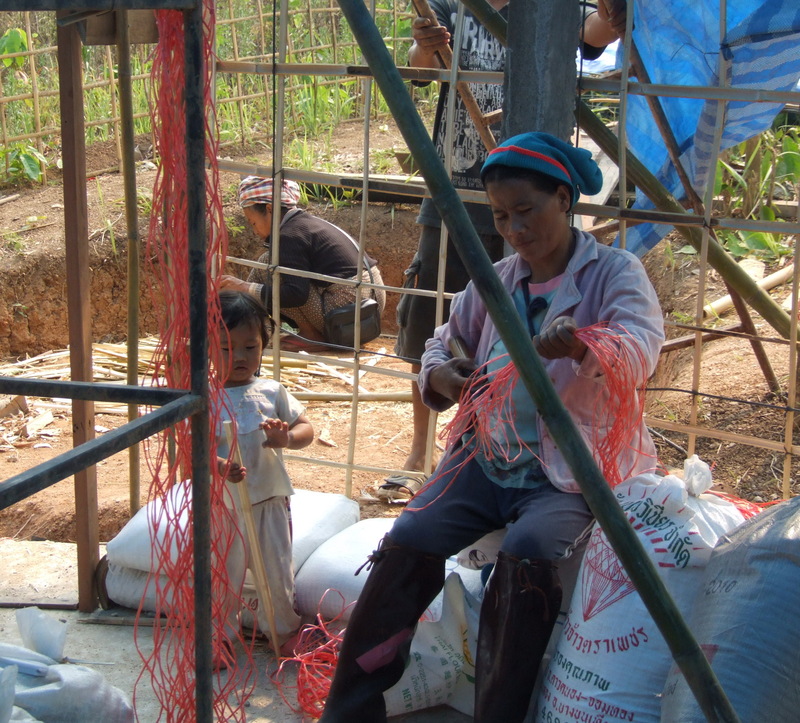 Our littlest worker helps prepare the string to attach the bags to the bird cage. I can’t believe how much easier, and faster, this second dome is going up! This is the second day of ‘bagging’. The second day of ‘bagging’. Note the neat way the window fits into the structure, when compared to the trouble we had with the first dome windows (note for Niko, Sally and Will!). We decided to put a number of glass bottles in the roof as they looked so good in the first dome. This means finding the bottles, cutting them in two, and joining the bottom halves. The worry is that water will get in around them, so old bicycle tires were cut up to make sort of washers around the ends. 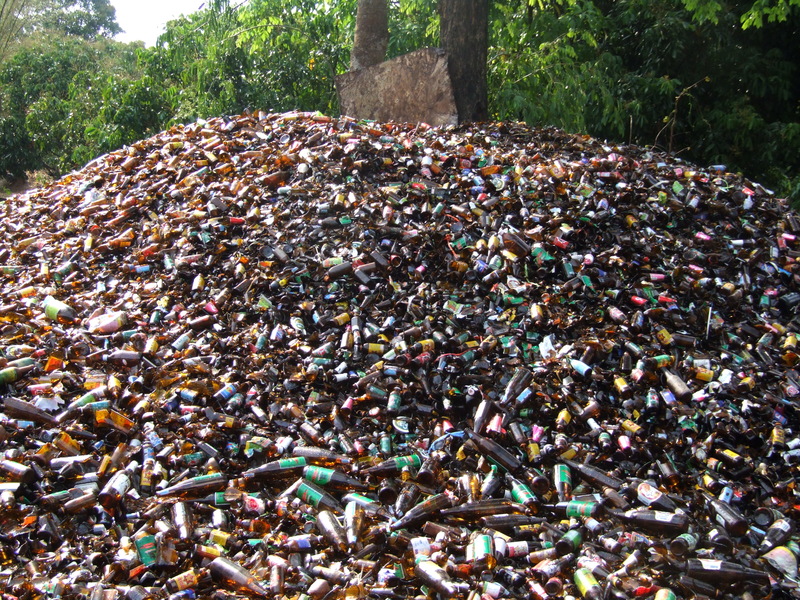 Plenty of bottles to choose from at the local recycling yard. 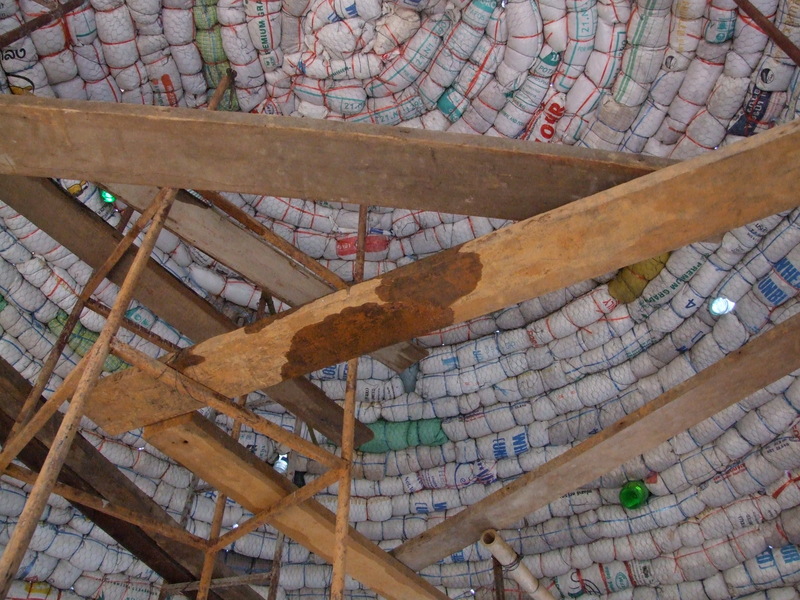 The last bags and bottles are in the roof of the Jungle Dome. Beginning to cover the roof of the dome. 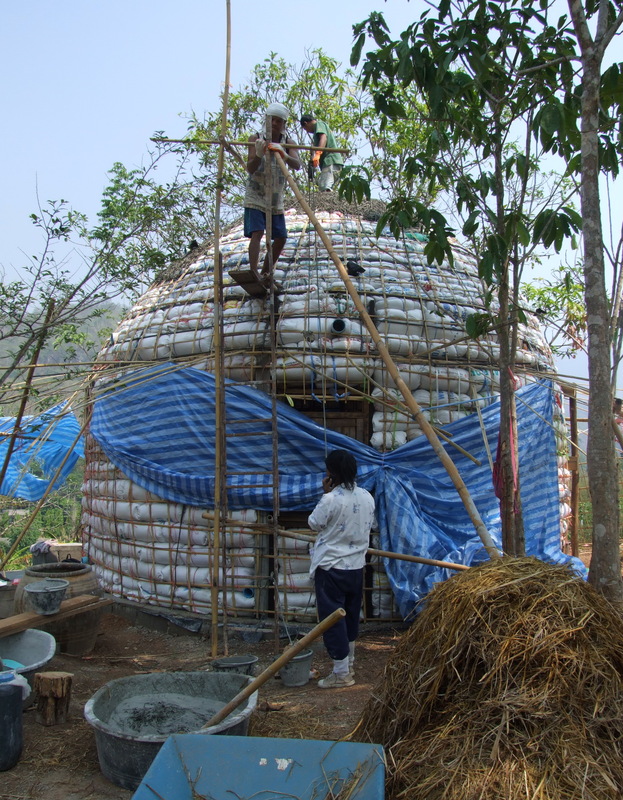 And the Jungle Dome gets its first covering of straw dipped in cement and water. Note the lovely shape of this dome! I had a shock a few days ago. My landlady said that she wanted her house back in a month! I raced around looking for other places to rent, but nothing seemed right. So I decided to go ahead and build a place for myself on site. 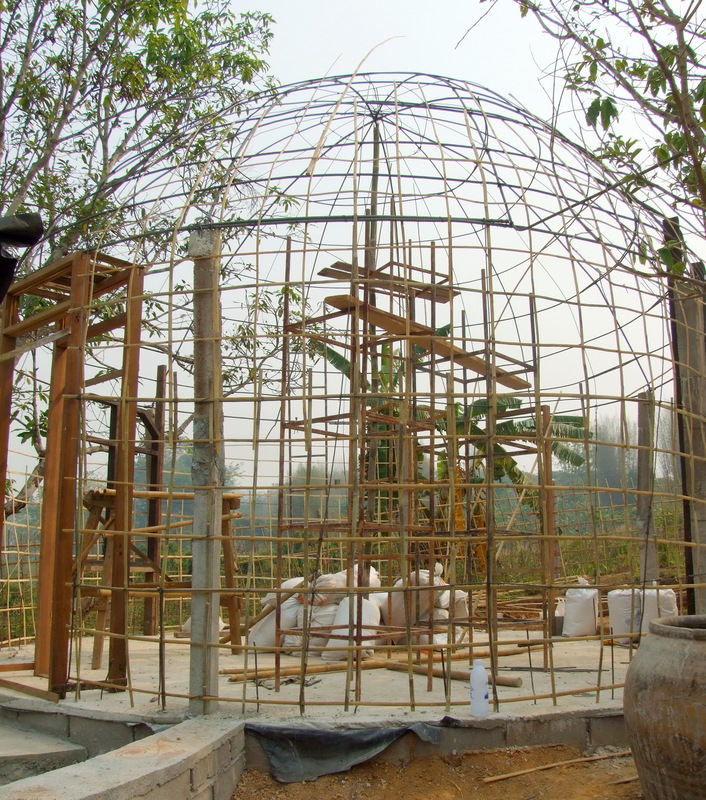 As I am working to a time table and my own place is right at the end of that table, I need to build something that will go up quickly, so the plan is to make the foundation for two domes, but walls and roof of bamboo and thatch. Then later I will change this to a rice-husk-bag and earth structure – probably of 4 connecting domes. So the next blog will be of our race to get me, Toni and the kittens a place to stay – in less than 4 weeks! Nice work.hope we can get up your way to see. And yes the second dome seems to go up much faster and at less expense. Practice I guess. Will also be interested in how the domes fair over time. How much settling /compacting of the rice hulls on the bags do you anticipate.what are you using for an exterior finish? Thanks Robert. 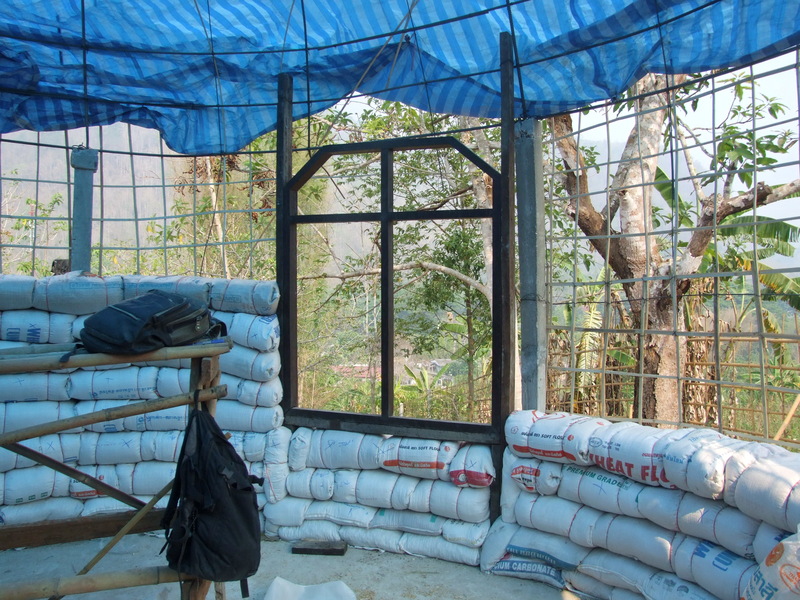 Not sure how the rice husks will settle – a friend is going to do some research on this using my domes so that others will have the benefit of knowing what is going to happen over time. Exterior will be cement down to the overhang, then earth underneath. But all on hold while we make a place for me to stay! On our small dome we used a formula using about 70% rice hulls. It seems to be working well for the infill the finish coat uses an lime,burned rice hulls sand and some cement…after a year only a couple very small cracks not deep and easily repaired. We chose to usea masonry undercoat and paint…it is working eexcellently as it breathes and does not allow water migration, and works with concrete and or earthen walls.